JACKSONVILLE, Ill. - May 4, 2016 - The road to Joey Saldana's third World of Outlaws Craftsman® Sprint Car Series victory of the season was not an easy one, but Saldana did what he had to, overcoming fierce challenges and near misses Wednesday night at Jacksonville Speedway. "It was one thing I learned here tonight - if you do get into trouble, just be patient with the bottom," Saldana said. "Just stick with it. So I just tried to do a better job than what I've been doing in the past and it paid off tonight." Saldana, who started from the pole after a Dash inversion of eight put him in position, lost the lead in the feature on lap eight to Aaron Reutzel and slipped back to third. He battled back around Shane Stewart and then Reutzel to regain the lead ten laps later and avoided getting tangled in the various cautions and red flags. Saldana said the win is a big boost for his No. 83 Roth Motorsports team on a challenging short track following struggles in California through the last two months. "Luckily Dennis and Teresa (Roth) were patient with us and with me and we've definitely turned it around here because this is a true short track," Saldana said. "We did everything right tonight and I can't thank everyone at Roth enough for what they do for us - giving the opportunity to compete at this level." Saldana joins Christopher Bell as the only two winners of a World of Outlaws event at Jacksonville. Logan Schuchart kicked off the night's action after taking the qualifying quick time with a lap of 10.805 over 45 other entered cars - the largest field of the season, so far. Saldana and Reutzel led the field to the green flag on the tight, 1/4 mile bullring. Saldana jumped out to the early lead through the first three laps until a caution flag flew. Back to green, Reutzel needed just four laps and a slip up from Saldana as he exited turn four to take over the lead. Stewart followed up Reutzel and threw a slider on Saldana as the two drivers worked their way through turns three and four to take over the second position on lap 10. The move for Stewart was short-lived though as Saldana used a lapped car as a pick and got back around Stewart's No. 2 Eneos/Larson Marks machine. "I went from first to third. I just had to be real patient on the bottom," Saldana said. "It was easy to miss it, so I just started running on the bottom, patient with that. And then just run the top in open track. I figured if I hit my marks it was going to be tough for them to get by me." With Reutzel back in Saldana's sights, he began to close back on the lead. Just short of halfway, Saldana made his move, getting around Reutzel to retake the lead as the two drivers drove off of turn four. The next lap by, Stewart got around Reutzel for second. With traffic in play, the leaders stayed close to each other, with Stewart looking for a line around Saldana. Back in the field, Brad Sweet, who started in fifth and Donny Schatz, who started in 16th and would go on to take the night's KSE Racing Hard Charger Award, were moving forward. Sweet was in fourth and Schatz was picking off his opponents, moving into third by lap 26. As the battle intensified up front, multiple cautions and a red flag changed the complexion of the night as it tightened the field back up and forced Saldana to go on defense. One final caution came out with three laps remaining as Sheldon Haudenschild spun in front of the leaders - all were able to avoid the No. 93 car. On the final restart, Saldana jumped out to a safe lead as Stewart and Sweet battled for the second position with Schatz just behind. Ultimately, it was Stewart who took the position. Sweet finished in third in his No. 49 Razorback Professional tools car and Schatz fourth. "Brad kind of snookered me there on that one restart and got by me," Stewart said. "I felt like I had five or six bad laps there and I felt like if I could have done that differently, the outcome may have been a little different. Once you get out front your car acts so different. Joey had a great car so congrats to him and his team." Stewart, who sits in second in the championship standings has been the picture of consistency throughout the season. He has two wins, including seven podium finishes, as well as 13 top-five finishes and 20 top-10 finishes. Sweet, the current championship points leader, picked up his 12th podium finish of the season, the most of any driver. Tonight, Sweet said, was all about finding the right line. "You're always searching for grip and the right line and they're hard to win because of that," Sweet said. "There's always someone behind you searching for the right line. We had a good car. We had a car capable of winning, I just didn't do a good job on that last restart and let Shane get back by me. We'll take a top three out of here. There's a lot of cars here, a lot of competition, a lot of mayhem and that's short track racing at its finest." Saldana's win tonight was his 97th career World of Outlaws victory. That mark, which places him sixth on the all-time wins list, puts him just 10 wins short of Doug Wolfgang, who sits fifth with 107 wins. "I'm just thankful to be here and now we're off to one of my favorite tracks," Saldana said. "Hopefully we can carry this momentum into Eldora." The World of Outlaws Craftsman® Sprint Car Series returns to action at Eldora Speedway for the #LetsRaceTwo double-header on Friday, May 6 and Saturday, May 7. For more information and to learn how to purchase tickets, visit WoOSprint.com/Eldora-Speedway. 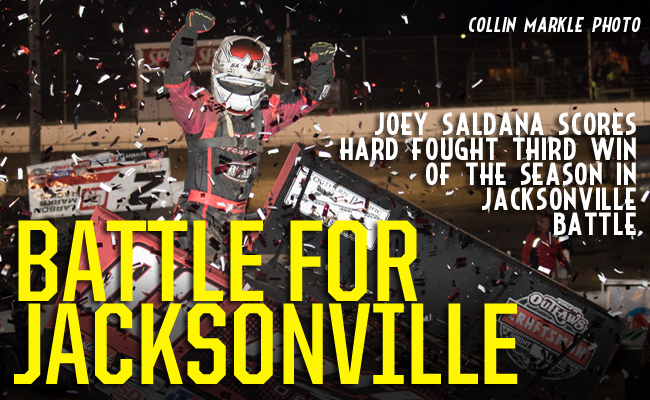 RACE NOTES: Joey Saldana's win tonight makes him just the second ever series winner at the track. In the series' only ever appearance at Jacksonville Speedway, Christopher Bell won… Donny Schatz was the night's KSE Racing Hard Charger, advancing 12 positions to finish in fourth… Logan Schuchart picked up his first quick time award of the season after a lap of 10.805 seconds around the small bullring… After tonight, Brad Sweet has 12 podium finishes so far this season - the most of any driver. CONTINGENCY WINNERS - MSD Ignitions ($25 cash): Kody Kinser; MSD Ignitions ($50 cash): Joey Saldana; Penske Shocks ($50 cash): Donny Schatz; JE Pistons ($50 cash): Aaron Reutzel; VP Racing Fuels ($50 cash): Logan Schuchart; Edelbrock ($50 cash): Logan Schuchart; Comp Cams ($50 cash): Jason Sides; Morton Buildings ($50 cash): Jason Sides; Cometic Gasket ($50 cash): Greg Wilson; Super Flow ($50 cash): Jason Johnson; Craftsman/Sears ($100 cash): Aaron Reutzel; KSE Racing Products ($100 product certificate): Donny Schatz; Comp Cams ($50 product certificate): Joey Saldana; JE Pistons (Set of Rings): Jason Johnson; JE Pistons (Set of Rings): Kody Kinser. SEASON WINNERS: Donny Schatz - 5 (Volusia Speedway Park on Feb. 14, The Dirt Track at Las Vegas on March 4, Stockton Dirt Track on March 18, Stockton Dirt Track on March 19, Silver Dollar Speedway on April 2); Brad Sweet - 5 (Volusia Speedway Park on Feb. 13, Volusia Speedway Park on Feb. 14, Cotton Bowl Speedway on Feb. 26, Ocean Speedway on April 1, Bakersfield Speedway on April 15); Daryn Pittman - 3 (Royal Purple Raceway on Feb. 27, Perris Auto Speedway on April 16, USA Raceway on April 18); Joey Saldana - 3 (The Dirt Track at Las Vegas on March 3, Devil's Bowl Speedway on April 22, Jacksonville Speedway on May 4); Shane Stewart - 2 (Arizona Speedway on March 6, Devil's Bowl Speedway on April 23); David Gravel - 1 (Thunderbowl Raceway on March 12); Jason Johnson - 1 (Placerville Speedway on March 24); Jason Sides - 1 (I-30 Speedway on April 26). World of Outlaws Craftsman® Sprint Car Series Statistical Report; Jacksonville Speedway; Jacksonville, Ill.; May 4, 2016.